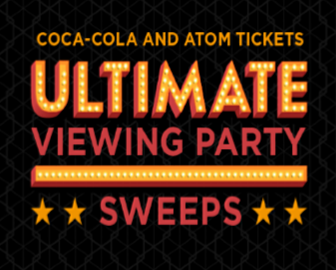 Coca-Cola and Atom Tickets Ultimate Viewing Party Sweepstakes – Win 51 movie tickets & Coca-Colas for a movie! Win 51 movie tickets & 51 Coca Cola beverages for a single movie showtime! ENTER SWEEPSTAKES HERE – Coca Cola Sweepstakes page. ENTRY LIMIT – Limit: 1 Sweepstakes entry and 1 Instant Win Game play per person per day during the Promotion Period, regardless of method or combination of methods of entry. ELIGIBILITY – The Coca-Cola and Atom Tickets Ultimate Viewing Party Sweepstakes is open only to legal residents of the 50 United States (or the District of Columbia) who are 18 years of age or older at the time of entry. SWEEPSTAKES ENTRY PERIOD – The Promotion begins at 12:00 a.m. Eastern Time (“ET”), October 1, 2018 and ends at 11:59 p.m. ET, December 7, 2018. PRIZES – 1 GRAND PRIZE: Up to 51 movie tickets and 51 Coca-Cola beverages, good for a single movie showtime on or before July 31, 2019. Limitations apply – not valid at all theaters, and total ticket amount not guaranteed as fewer than 51 tickets may be available based upon ticket/seat availability for the selected showtime. Terms and conditions apply. Approximate Retail Value (“ARV”): $1,500. 10 FIRST PRIZES (1 per Week): “Movies for a Year” fulfilled as a $360 Atom Tickets digital code credit, valid from December 1, 2018 through December 31, 2019. Terms and conditions apply. ARV: $360. 100 SECOND PRIZES (10 per Week): A pair of Movie Tickets, fulfilled as a single-use $30 Atom Tickets digital code credit, valid from October 1, 2018 through December 31, 2018, terms and conditions apply. ARV: $30. 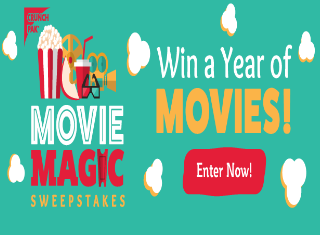 Crunch-Pak Movie Magic Sweepstakes – Win one year of movies! Win one year of movies (awarded as a Fandango gift card)! ENTER SWEEPSTAKES HERE – Crunch Pak Sweepstakes page. ENTRY LIMIT – Limit one (1) entry per person or email address per day. ELIGIBILITY – The Promotion is open only to legal residents of the fifty (50) United States, the District of Columbia (excluding Puerto Rico and all other US territories) who are 21 years of age or older at the time of entry. SWEEPSTAKES ENTRY PERIOD – The Movie Magic Sweepstakes commences at 12:00:01 AM Eastern Time (“ET”) on March 1, 2017 and ends at 11:59:59 PM ET on April 12, 2017. PRIZES – Six (6) Prizes will be awarded. One (1) Prize Winner (“Winner”) will be randomly drawn from among all eligible entries received, and awarded the Prize consisting of: One year of movies in the form of a Fandango gift card. The approximate retail value (“ARV”) of this Prize available to be won in this Promotion is $525.00 USD. Five (5) Prize Winners (“Winner”) will be randomly drawn from among all eligible entries received, and awarded the Prize consisting of: (1) Deluxe gift baskets valued at $75, including a $25 Fandango gift card, a blu-ray and digital copy of either Finding Dory or Star Wars: The Force Awakens ($25), popcorn, vouchers for free Crunch Pak products, and either Finding Dory (tshirt, lunch box, plush toy) or Star Wars movie-themed gear (tshirt, lunch box, light saber) The approximate retail value (“ARV”) of this Prize available to be won in this Promotion is $75.00 USD. “MIKE AND IKE® Win Movies for a Year” Sweepstakes – Win movie tickets for a year! 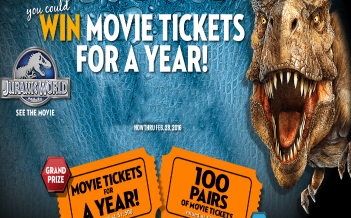 Win movie tickets for a year! ENTER SWEEPSTAKES HERE – Mike & Ike Sweepstakes page. ENTRY LIMIT – Limit one (1) entry per person/email address per day. ELIGIBILITY – Open and offered only to legal residents of the fifty (50) United States and District of Columbia, who are thirteen (13) years of age and older. SWEEPSTAKES PERIOD – Just Born’s “MIKE AND IKE® Win Movies for a Year” Sweepstakes begins at 12:00:01 a.m. Eastern Time (“ET”) on April 1, 2015 and ends at 11:59:59 p.m. ET on February 28, 2016. PRIZES – Grand Prize Fandango Promotional code is good towards up to $1,500 in movie tickets at Fandango partner theaters in the U.S., at any showing including those designated as “no coupons, no passes” in local theater listing guides. 100 – First Prize Fandango Promotional code is good towards two movie tickets up to $13 in value per ticket ($26 total value) to see any movie at Fandango partner theaters in the U.S.